don't be a coconut: Covers, B-Sides, and Rarities: Maxïmo Park's "Just Dance"
Covers, B-Sides, and Rarities: Maxïmo Park's "Just Dance"
I don’t know what it is that doesn’t strike my fancy when it comes to Lady Gaga. Is it her fashion sense? Is it her downright weirdness? Friends have tried to convince me otherwise, and I am acknowledging the fact that she’s both an accomplished singer and song-writer-- as in y’know, in comparison to most mainstream female artists in abundance these days. But nothing about her songs appeals to me, and her bizarreness added together makes me repel from her music entirely. 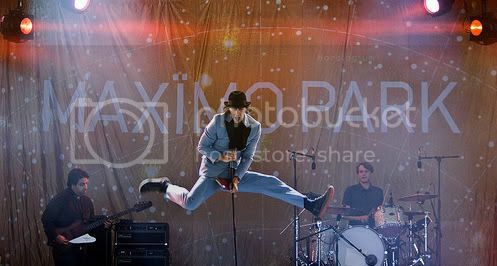 Photo of Maxïmo Park by Reinier Asscheman on Flickr. ‘Just Dance’ is pure “turn-off-the-radio-or-I’ll-throw-it-out-of-the-window” inducing for me. But when Maxïmo Park comes along and produces their own rendition of the song, complete with electronic flourishes and infectious guitar works, it seems that I might be persuaded after all.